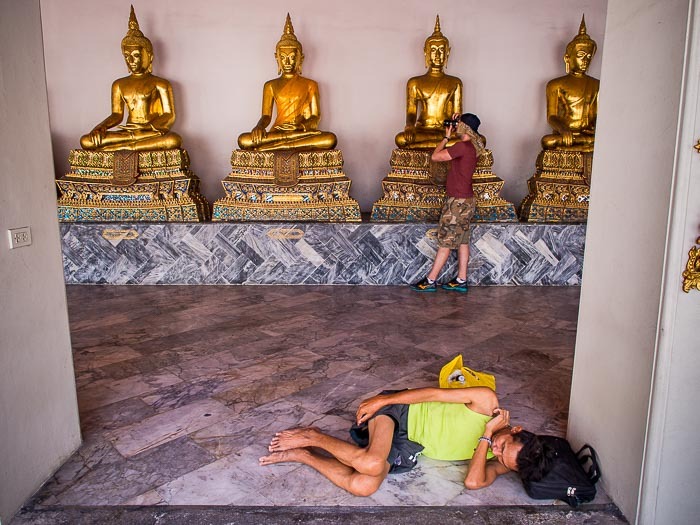 A tourist photographs Buddhas at Wat Pho while a man sleeps in the temple. Thai tourism is in something of a crisis right now. Tourist arrivals year to date are down more than 10%. It has been a rough year for Thai tourism. The protests led by Suthep Thaugsuban crippled the high season (roughly November - March). Random politically inspired shootings, riots, and grenade attacks apparently scared off tourists. At the same time, Thailand's neighbors, Cambodia and Myanmar are rapidly improving their infrastructure, competing for tourism dollars with Thailand. 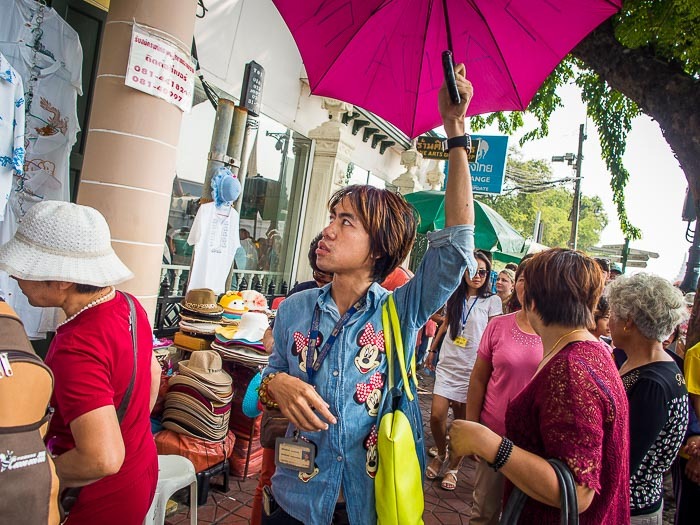 A tour guide leads his clients through Bangkok. Tourism officials hoped the coup in May would restore confidence in the tourism industry but it hasn't. Last month, British tourists were horrifically murdered on a resort island. Police botched the investigation before arresting undocumented Burmese migrant workers. At one point they hauled the suspects out to the scene of the murder and reenacted it. British journalists covering the investigation were drafted into playing the role of the victims. None of this has restored faith in the tourist industry. Tourism is about 10% of the economy here, so a double digit drop in arrivals reverberates throughout the economy. 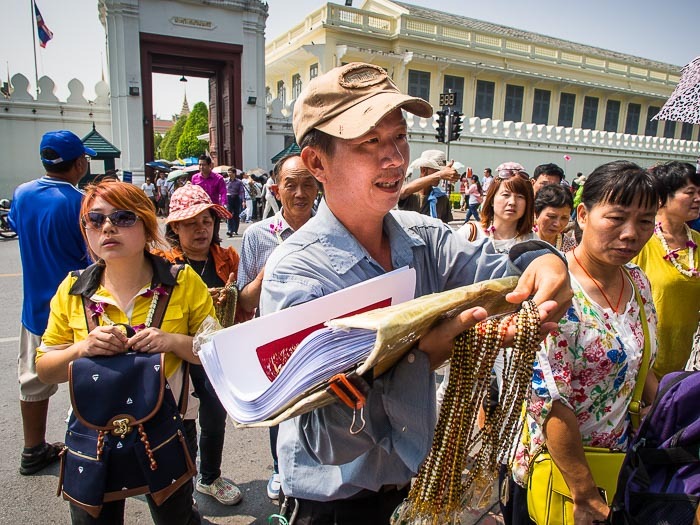 A souvenir vendor chases tourists in the street near the Grand Palace (background). Despite all of this, Thailand is still a great country to visit. Crime against tourists, considering the number of tourists who come here, is pretty low. I don't worry about street crime when I go out, whether it's day or night. The attractions that made this a great country to visit last year - the beaches, the gracious people, the historic attractions, the food - are still wonderful. Traffic is a nightmare, which is why I don't drive here, but otherwise it's still a charming place. A tourist puts coins into a bowl, making a donation at Wat Pho. Despite its reputation as an "anything goes" place, Thais are quite modest and tourists are expected to dress modestly when they visit temples. 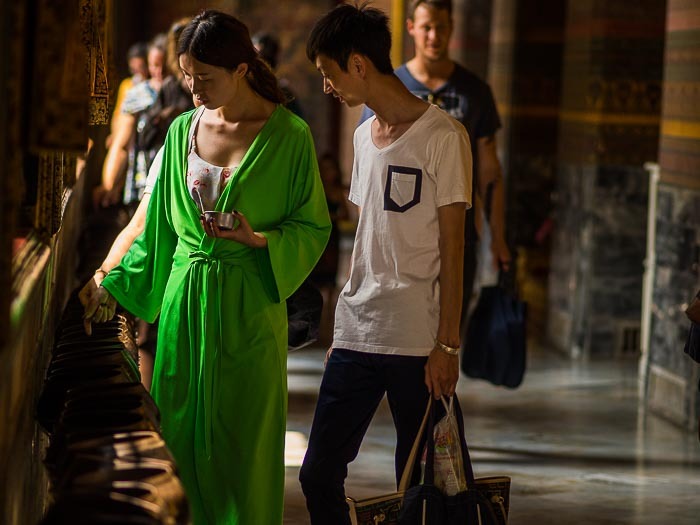 Some temples, like Wat Pho, provide lime green robes for tourists who dress in revealing clothes.